Dust off your whisks, spatulas and measuring spoons. It’s time to help animals in need by baking! Crusoe the celebrity Dachshund has jumped on board as our National Cupcake Day™ animal ambassador and he is already busy planning his pupcake party with his wiener dog friends. Take part in National Cupcake Day™ by hosting your own cupcake party at your home, school or workplace on the sweetest day of the year – February 26th, 2018. Enter to win the ultimate baking prize pack! Register by January 31st and refer a friend to be entered to win this sweet prize! Visit our blog to learn more. Bake a difference in the lives of animals who need you most! Reports of animals left outside have been on the rise this January due to the Arctic like temperatures felt across much of the province. Cold weather can be harmful to your pets and exposure to harsh conditions can cause serious illness or death to animals. A car is not a safe place to leave a pet. Cars hold in the cold, acting like refrigerators, which could cause your dog to freeze to death. Call 310-SPCA (7722) or your local police if you see a pet left in a vehicle. When the temperature drops below freezing, pets should not be left outside for extended periods. Cats, short-coated dogs and puppies are particularly vulnerable in cold temperatures. Keep cats indoors and protect your dogs from frostbite or hypothermia by taking them outside for short periods during cold weather. Read the blog Cold weather grips Ontario – Safety tips you need to know or listen to our recent Animals’ Voice Pawdcast for tips to keep your pets safe and how to recognize signs of hypothermia. Thank you to everyone who adopted and/or participated in the 2017 iAdopt for the Holidays campaign. With your support, over 4000 pets from participating organizations across Canada, found their forever homes and were able to spend the holiday season with their new families. 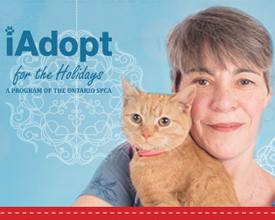 Ontario SPCA Animal Centres saw over 1,600 animals find their forever homes during November and December thanks to people like you who adopted or helped spread the word! We are also excited to announce the winner of our grand prize online contest! Bella the cat from Bracebridge, ON will be enjoying free pet food for a year, courtesy of Royal Canin Canada, after her owners entered the grand prize draw and were this year’s lucky winners. We look forward to hearing updates from our furry friends as they settle into their new homes. 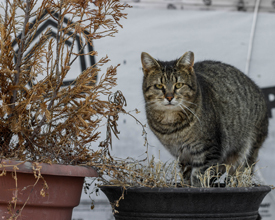 There’s a staggering amount of feral cats trying to keep warm this winter. The Ontario SPCA is working with feral cat caretakers to help manage colonies and keep the kitties safe during the cold months. Thanks to our wonderful corporate volunteers, handmade cat shelters provide a safe, warm place for feral cat colonies. (Click here to make your own affordable DIY cat shelter). The Ontario SPCA also set up a free feral food bank, providing a sustainable support of food to colony caretakers. This helps alleviate the financial burden for dedicated feral cat colony caretakers who use their own personal funds to provide food for the cats. These are just two of the programs in place to help the thousands of homeless cats in Ontario. Find out more by reading our blog, Ontario SPCA programs to help chilly feral kitties. While cats and dogs make up the majority of adoptions at Ontario SPCA Animal Centres, we also see a lot of birds find loving homes. Birds can make lovely pets but before you decide to bring one into your family, make sure you do your research. 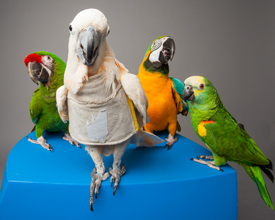 According to Guiness World Records, the oldest living Parrot was documented as 82 years old. Owning a bird is a long term commitment that requires dedication and planning. Check out our blog for great tips and information on bird care. It’s easy to want to hibernate through the cold winter months, but even on the coldest of days, our pets need exercise and stimulation. So while we may not want to head outdoors, there are plenty of activities we can still do with our pets in the warmth of our homes. 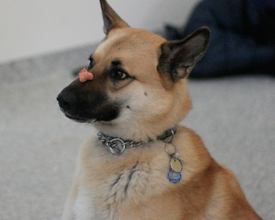 In a recent blog, Keeping pets healthy and busy during the cold months, guest writer Dr. Ryan Llera shares some of her ideas for indoor activities.